Companies are spending more on content, but many are unclear on what the best practices are for creating high quality content over a long period of time. This presentation will share a practical framework for creative and efficient content creation that leverages a mix of evergreen, repurposed, curated and co-created content that attracts, engages and converts new business. It's vital to use the right approach to content marketing strategy, since otherwise developing creative, workable ideas for effective content marketing can be a challenge that wastes time and money. 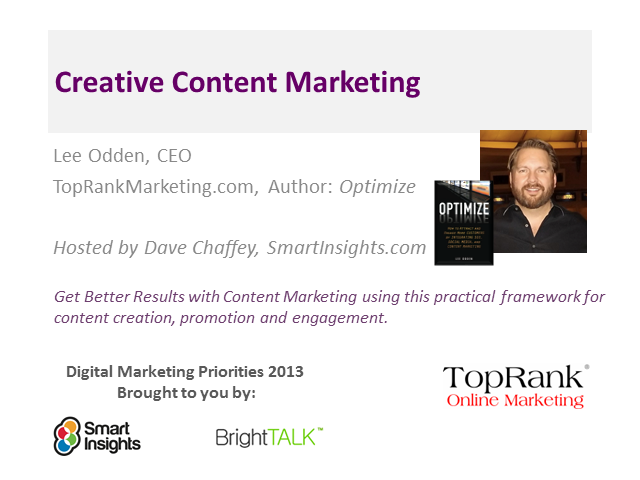 Lee Odden is author of Optimize: Win more customers with Social Media, SEO and Content Marketing. He is CEO of TopRank Online Marketing, a Minneapolis based digital marketing agency. You may also know him from the TopRank Online Marketing Blog, recognized as a leading business blog by Advertising Age, Junta42 and Social Media Examiner, attracting hundreds of thousands of monthly visitors and over 50,000 subscribers.